Cynthia Cockburn,London: Zed Books, 2007, 286pp., ISBN 978 1 84277 821 0 (Pbk), £16.99; ISBN 978 1 84266 820 3 (Hbk), £55.00. Cynthia Cockburn's From Where We Stand is one of the most important books addressing anti-war activism, feminist or otherwise. Based on two years of field research that spans all corners of the globe, Cockburn reports on women's anti-war movements with unprecedented detail, offering complex and unique analysis of these movements that address questions as specific as the operational tactics of each movement, and as broad-ranging as the relationship between gender and war. The book tackles some tough issues for feminist politics, including the nature of gender identity and the relationships among feminism, pacifism, nationalism and racism, but does so in a way that makes theoretically sophisticated debates accessible to non-specialist audiences. For example, in discussing the question of whether there are essential commonalities between women and/or feminisms, Cockburn relates a conversation with activists she interviewed in Italy, who described the issue in terms of rooting and shifting (p. 101). In this discourse, ‘each of us brings with her the rooting in her own memberships and identity, but at the same time tries to shift in order to put herself in a situation of exchange with women who have different memberships and identity’ (p. 101). Cockburn provides similar lucid explanations on issues of nationalism and racism in Chapter 7. The book is made up of a combination of empirical material and theoretical analyses of that empirical material. Cockburn's first chapter, ‘Different wars, women's responses’, analyses local movements in response to the longstanding conflicts in Colombia, Gujarat and Sierra Leone. This flows nicely into Chapter 2, which analyses three global women's anti-militarist movements, including Women in Black, Code Pink and the East Asia-US-Puerto Rico Women's Network against Militarism. Chapters 3 (concerning Serbia) and 4 (concerning the Israel/Palestine conflict) deal with women's movements that (try to) transcend or defy ethno-nationalist conflicts to seek peace, paying close attention to the relationship between peace and justice in the goals of these women's movements. Chapter 5 then turns to the largest and most established women's peace organization, the Women's International League for Peace and Freedom (WILPF), which dates back to the World War I era and is represented in most states throughout the world. Specifically, Cockburn analyses the successes and challenges that WILPF encountered in campaigning for and then trying to enforce United Nations Security Council Resolution 1325, mandating gender mainstreaming in peace processes. The final four chapters of the book weave these and other empirical studies into a theoretical framework that asks how women protest war, what they protest, what women's peace movements have in common, and what this means for the relationship between feminism and war. Chapter 6 explores whether the methods of these women's peace groups of different sizes, organizations and purposes have anything in common. She notes that women's peace organizations generally have minimal structure, prioritize responsible process, choose environmentally sensitive methods and use tactics including vigils, legal action, ritual and symbolism, and peace camps and other non-violent direct action. Although there is substantial variation in these methods, Cockburn observes that many members of women's peace movements identify their tactics as specifically related to their gender. If women's peace movements have something in common tactically, Cockburn asks, in Chapter 7, whether they have anything in common substantively. She notes that there are definitely fundamental differences of opinion on key questions among women's peace movements, including (though by no means limited to) how to deal with conflicts between peace and justice, the compatibility of nationalist/local identity and the search for peace and the role of issues of race in ethnic and gender conflict. Cockburn suggests that these tensions could be seen through the lens of Nira Yuval-Davis’ (1999) concept of transversal politics, which pays attention both to personal positionality and the positions and perspectives of others. 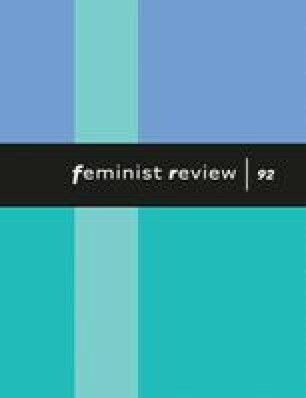 The implications for the relationships among feminism, gender and war (Chapter 9) are the book's most radical and most theoretically important contributions. Cockburn suggests that in addition to the political and economic causes of war, gender is a crucial variable in the constitution of war generally and the cause of wars specifically. From a feminist perspective, Cockburn suggests that theorists turn away from theories that ignore women and gender, and turn to theory grounded in women's experience of war. Such a theoretical perspective would, according to Cockburn, recognize the crucial interrelation between the construction of gender roles and the performances of war-making and war-fighting. In reading this book, I find myself amazed by the amount of research that went into it (and is still going on at www.cynthiacockburn.org), and by its theoretical sophistication. My own research background, however, leads me to wonder whether the relationship between gender and war has been fully explored in this book. For example, in Chapter 8, Cockburn mentions that there are women who want to be soldiers (and, in my work, terrorists and guerillas – see Sjoberg and Gentry, 2007), but only extrapolates from that point that there is no validity to essentialist stereotypes about women's pacifism. I would have enjoyed Cockburn taking this analysis further to explore the impact of violent women on the relationships between women, feminism and war analysed in Chapter 9. Still, from its rich empirical evidence to its accessible yet cutting-edge theoretical perspectives, From Where We Stand is a crucial read for anyone interested in war generally, or gender and war specifically. Cockburn's attention to detail and positionality is accompanied by a steadfast refusal to lose sight of the big picture – where gender is a linchpin of war, and that relationship can be observed through the careful study of women's peace movements.